To use a character that was previously created and stored in the Library, you need to import it into your scene. 1. Create your new Toon Boom Studio project—see Creating and Opening a Project . 2. 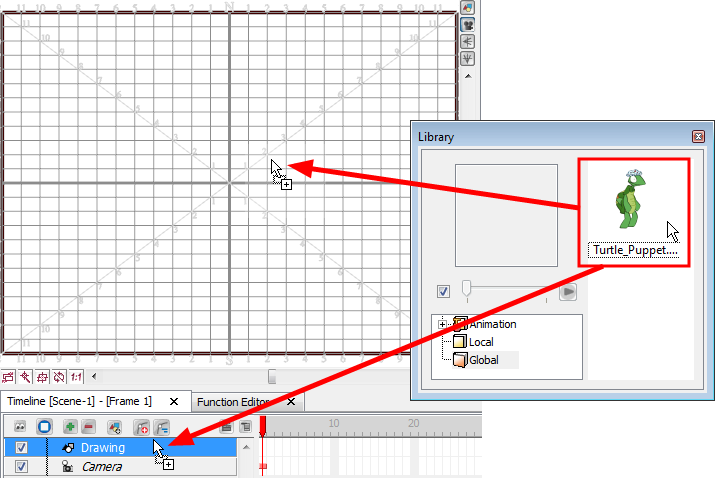 In the Library view, select the template of the character you want to animate. 3. Drag the selected template to the Camera or Timeline view's left side. The puppet appears in the Timeline view. 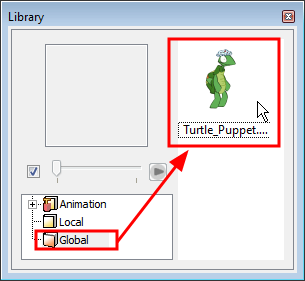 Refer to Animating a Puppet to learn more about the Library view. 1. In the Timeline view, click the arrow beside the top layer of your puppet to collapse it. In the Timeline view, select your puppet main layer and select Element > Cell > Extend Exposure or press [Ctrl] + [Shift] +  (Windows) or [⌘] + [Shift] +  (Mac OS X). 2. In the Extend to Frame field, enter the planned final frame of your animation and click OK. This extends the exposure of every element contained in your puppet. Refer to Traditional Digital Animation to learn more about exposure and timing. When several layers such as drawings and pegs are parented to another layer such as a peg, you have the possibility to expand the exposure of all parented layers at once by collapsing the main layer and using the Extend Children Exposure function. 1. In the Timeline view, in the puppet layer's row, select the frame to where you would like to extend all the layers' exposure. Make sure the main layer is collapsed. 2. Right-click on the frame and select Extend Children Exposure. The children's exposure is indicated by a thin bar. When you uncollapse the Puppet Peg layer, the children's extended exposures are revealed.